In the PREVention and Acute treatment of chronic cluster headache (PREVA) study, attack frequency reductions from baseline were significantly more pronounced with non-invasive vagus nerve stimulation plus standard of care (nVNS + SoC) than with SoC alone. Given the intensely painful and frequent nature of chronic cluster headache attacks, additional patient-centric outcomes, including the time to and level of therapeutic response, were evaluated in a post hoc analysis of the PREVA study. The trigeminal autonomic cephalalgias (TACs) are highly disabling primary headache disorders. There are several issues that remain unresolved in the understanding of the pathophysiology of the TACs, although activation of the trigeminal–autonomic reflex and ipsilateral hypothalamic activation both play a central role. The discovery of the central role of the hypothalamus led to its use as a therapeutic target. After the good results obtained with hypothalamic stimulation, other peripheral neuromodulation targets were tried in the management of refractory cluster headache (CH) and other TACs. 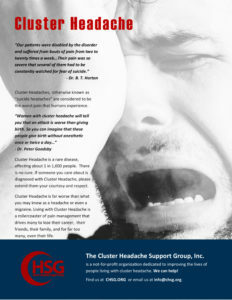 Chronic cluster headache is a rare, highly disabling primary headache condition. When medically intractable, occipital nerve stimulation can offer effective treatment. Open-label series have provided data on small cohorts only.